“Research designed to sway individuals of a various group, be they meteorologists or engineers, to a politically contentious viewpoint is not science — it’s propagandizing,” the senators wrote to the foundation’s inspector general. The four Republicans — James Inhofe and James Lankford of Oklahoma, Ted Cruz of Texas and Rand Paul of Kentucky — requested an investigation into whether the grants, which have been in place for almost ten years, violated federal law. From the Arctic Circle to Japan, via Europe and America, the northern hemisphere is sizzling. In parts of Finnish Lapland temperatures recently hit 32.1ºC (89.8ºF), some 12ºC warmer than is typical for July. 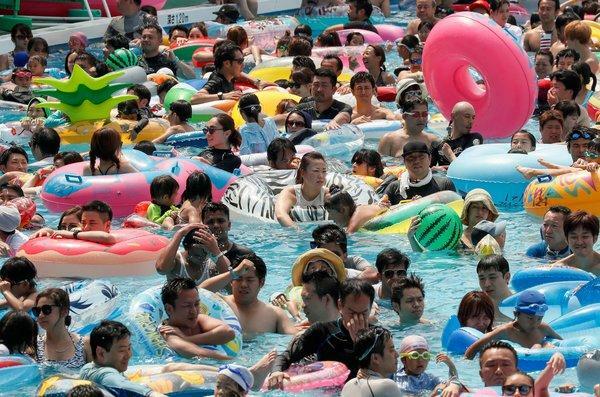 In Japan, where a record 41.1ºC has been reached, at least 65 people have died and a natural disaster has been declared. Wildfires have raged in Sweden and Greece. There looks to be no let-up to the swelter over the coming days—weeks perhaps. That will please sun-seekers. But heatwaves mostly bring problems, especially in the developing world: crops are ravaged, food spoils and workers become less productive. Studies even suggest that violent crime rises. Such extreme weather was a once-a-millennium outlier. But man-made climate change makes it more likely. Humans are getting better at living with heatwaves, from installing air-conditioning to painting shanty-town roofs white. Better to deal with the cause of the problem. Nothing in that list is new to me – all the events mentioned took place over the span of at least several days and they are all in various stages of development that have been covered throughout – but the piece summarizes them nicely. The Economist piece and all of the NYT articles above had opening photographs. I chose to copy the one depicting the heat wave in Japan because it addresses people’s attempts to cope with the extreme weather. The picture also demonstrates the issue that facilities for such coping methods are becoming a bit crowded. It is interesting to try to figure out how Messrs James Inhofe, James Lankford, Ted Cruz, and Rand Paul want TV meteorologists to explain the globalization and increased intensity and frequency of extreme weather events without invoking climate change. I’d also like to know their definitions of science and indoctrination and their expertise in differentiating between the two. “Can We Blame the Summer Heat Wave on Global Warming?” The relationship between weather and climate is complicated. To understand what extreme event attribution does, it’s helpful to think about it through a simplified analogy. There’s a bucket full of balls: Some are blue, and some are red. If we draw a blue ball, the weather will be moderate. If we draw a red ball, the weather will be extreme. Before global warming, the bucket contained almost entirely blue balls with a handful of red ones mixed in. Global warming is slowly swapping a few blue balls for red ones. If today there’s a hurricane, we know that a red ball was drawn. But we don’t know if it was one of the original red balls or one of the new ones contributed by climate change. What extreme event attribution does allow us to do is estimate how many red balls were added to the bucket. Is that analogy good enough to account for all these climate disasters? Air-conditioning is a luxury here. Not only do most homes not have it, but they are built to keep the heat in, experts say. As a result, the demand for fans has skyrocketed, leaving most stores in London out of stock. Be safe and stay tuned!!! This entry was posted in administration, Anthropocene, Anthropogenic, Climate Change, immigration, politics, refugee, Sustainability and tagged Adaptation, air conditioner, air conditioning, Anthropocene, Anthropogenic, attribution, Britain, California, causality, cause, Climate Change, Climate Change Denial, Climate Change Deniers, Climate Skeptics, coping, dam, Drought, Environment, Extreme Weather, Finland, fire, Flood, Global Warming, globalization, Greece, heat, heat wave, heatwave, indoctrination, intensity, James Inhofe, James Lankford, Japan, laos, Meteorologist, Meteorology, NSF, political, politics, Pool, probabilistic, propaganda, Rand Paul, Science, Sustainability, Sweden, Technology, Ted Cruz, UK, Weather, wildfire, World Population. Bookmark the permalink.